Akron is quickly becoming one of the best running towns in America. Be sure to check out our other features on the 2013 Akron Half Marathon, the 2014 Akron Half Marathon, and of course Mike’s struggles during his self-proclaimed worst race ever! 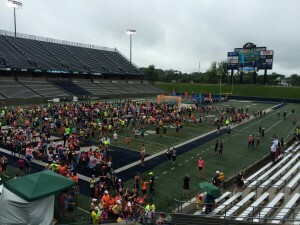 New to 2015, the Akron Marathon launched its inaugural Rubber City Race Series. Conceptually, the Series is a three-weekend event offering entrants the chance to accumulate points based on both participation (completing longer distances earns more points) and performance (top-three finishers overall and for age group scores additional points). For the wannabe Olympian who is already over-performing on expected placement medals for his career, the idea that I was “competing” in a multi-event series struck me as a fun twist as opposed to just racing a bunch of unrelated races. Staying dry before the race. The Thirsty Dog 8K and 1 Mile was the first of the three race dates (the inaugural Burn Rubber Half Marathon and 10K are scheduled for August 15, 2015 and the Dream Blue Half Marathon, Full Marathon, and Team Relay Marathon is scheduled for September 26, 2015). Although completion of a race on each date is not a pre-requisite for participating in the Rubber City Race Series, entrants score points for completing a race on each date, and I was not going to pass up the opportunity to score my points. 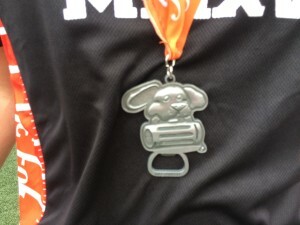 Plus, runners who complete a race on all three days will earn a special medal—and I do love a good SMO. Both distances for the Thirsty Dog were well-within my capabilities for running, as I have run two half marathons in the past two months (the Canton HOF Half Marathon and the Medina Half Marathon). The 8K was worth more points for the Series scoring, so I decided to run that race instead of the 1 mile distance. At a little under 5 miles (4.97, to be exact), the race did not require any additional preparation for me aside from giving myself the day before off for rest. The race’s 10:00 a.m. start time was a nice change for my typical wake-up-at-the-crack-of-dawn experience of being out of bed at 4:00 a.m. to make a race start. The start time meant that I could sleep in a little more and still make it to Akron with plenty of time to spare before the gun went off. The forecast called for lots and lots of rain. Therefore, I wore more than I typically do for a summer race. Instead of just a tech shirt and shorts, I added a rain jacket and a baseball cap to help try and stay dry. This worked at first, but as the race progressed, the rain dissipated and I was left carrying my jacket instead of wearing it. A minor inconvenience, but only so, as the race wasn’t long enough to be really bothered by it. No runner expo for this event. Instead, the organizers offered flexible packet and swag pick up. Runners were free to pick up their stuff either the day before between 11:00 a.m. and 7:00 p.m., or from 8:00 to 9:30 a.m. the morning of the race. I am a huge fan of events that give you the option of when to pick up your packet; yes it requires more volunteers, but it is far more convenient for the entrants, particularly those that aren’t keen on missing a day of work or springing for a hotel solely to comply with a required day-before pickup rule. The people organizing the Thirsty Dog get it, which helped make for a great kickoff event to the Rubber City Race Series. The 8K and 1 Mile events had a blend of common and distinct swag. Participants in both races received a cotton short-sleeve t-shirt and a post-race lunch provided by Winking Lizard. In addition, the Milers received a commemorative root-beer mug and a ticket for a Thirsty Dog root-beer tasting. 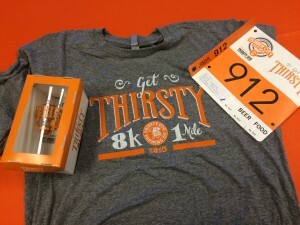 8K participants received a pint glass instead of a mug, a finisher’s medal, and five tasting tickets for either beer or root-beer. On this last point, however, I am not sure how the tickets worked. I did not stay to sample the beverages because I was soaked at this point, but my bib only had one ticket on it. With apologies to our California readers, the name of the game pre-race was avoiding the rain. Seriously: it was pouring Saturday morning, and I wanted nothing to do with the weather until I absolutely had to be out in it. 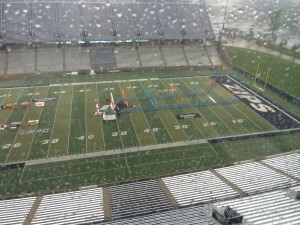 Like most of the other runners there that morning, I lingered as long as I could at the bib pickup inside the University of Akron’s InfoCision Stadium (done on the seventh floor, and offered a great view of the football field and the finish line). Once that was completed, I huddled in dry spots until the announcers instructed us to move to the starting chute. The one thing I would quibble with is how the starting chute was set up. The course set up metal barricade fences in a rather narrow chute alongside the stadium. This was done, I think, as a way to funnel the field through the starting line arch and again for when the course looped back through this area during the last quarter mile of the race. But I think the start could have been a little wider, as it was pretty crowded waiting for the race to start. This made it a little difficult to find my spot in the chute for how fast I wanted to run. This is probably a necessary evil for all races to some extent, though. 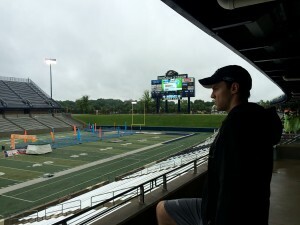 The course was laid out as a tour of the University of Akron, the neighborhoods surrounding the campus, and downtown Akron proper. It was a nice blend of views that one expects in a nice city race. The downtown stretches included a great skyline view as runners approached Main Street. The final mile of the course ran along the heart of the college campus and offered a brief glimpse of both the academic buildings and the athletic fields. A view of the finish line – see, we told you there was lots of rain that day! The Thirsty Dog 8K felt like a fast course. It did not have many hills at all, and none that I would have considered steep. In fact, the overall grade of the course felt more downhill than uphill (an odd assertion for a race that finished in pretty much the same place it started), but that’s how it felt. I had written off any course support the moment I saw the first downpour on my drive to the race. Akron proved how wrong my guess was. Volunteers and spectators were both out despite the inclement weather. The water stations had plenty of people passing out both water and Powerade, and I hardly noticed any congestion when I stopped for a brief refresher. And, while course support was affected to some extent by the rain, there was plenty of encouragement given the conditions, particularly along the home stretch. The highlight of the race, of course, was the finish at the 50-yard line of Summa Field—between this and the Canton Hall of Half Marathon, I might stop running any races that don’t end on the gridiron. The SMO is shaped like the logo for the Thirsty Dog Brewing Company. The design is an elegant tribute to efficiency: it depicts a floppy-eared Dog holding a beer mug in his mouth—presumably because he is Thirsty—with a bottle opener on the bottom. In the spirit of thoroughness, I tested the bottle opener out once; it did work, but it is clearly meant to be an aesthetic design. The Thirsty Dog SMO bottle opener. On the back of the medal, the Rubber City Race Series logo and race date/distance are engraved. Runners came storming into InfoCision Stadium and finished the race around mid-field. Volunteers were there in the “chute area” to provide high fives, hydration, and the finishers’ medals. After catching my breath, I made my way over to the food station to get my post-race lunch. Thirsty Dog was also offering taste testing for some of their select beverages, and although I did not want to wait in line for a drink bracelet, the volunteers gave me a shot glass with the race logo on the front to take home (bonus swag!). The tickets for both food and drink were conveniently attached to the bibs for easy removal. I elected not to bring my iPod along for this race because of the weather. Because the race was so short, I neither wanted to go through the hassle of waterproofing my iPod with a plastic bag nor wanted to risk breaking it by not protecting it from the elements at all. The finish line party on Summa Field. The 8K course offered five music stations spread fairly evenly throughout. Highlights include Icona Pop expressing how the runners felt about the rain during the third mile (I don’t care//I love it! ), Uptown Funk while we were downtown, and a little Eminem while nearing the home stretch (Lose Yourself). The Thirsty Dog was the first leg in the first ever Rubber City Race Series. Batting leadoff comes with the (perhaps undue) pressure of setting expectations for that which will follow it. And while I am not a mind reader, I don’t think it’s that bold of a prediction to speculate that the organizers were none too thrilled by the rain. Despite all that, I would consider the Thirsty Dog a success both in its own right and as a prelude to the rest of the Rubber City Race Series. The announcer before the race mentioned that over half of the Thirsty Dog’s 2000 plus entrants had already signed up for the other two races. To me, that says there was both a sizeable number of runners in the race just for the Thirsty Dog itself (with the opportunity to sign up for the other races), and a large group of people committed to completing the whole Series. The course was a fast, enjoyable lower distance race that offered a taste of the events to come, and I, for one, am already counting down the days to August 15th.